All personnel involved in the research (principal investigators, co-investigators, faculty advisors, and data collectors/analyzers), including those involved in projects exempt from review, must complete all applicable CITI training courses before they submit their application to the IRB. Which CITI Courses Do I Need to Complete? Question 1: Are you conducting research involving human subjects? Yes: Move on to Question 2. No: Your research does not require IRB review. Question 2: Are you involved with social and behavioral research or biomedical research? Social and Behavioral Research: Required CITI Courses – Social and Behavioral Research-Basic/Refresher & Social and Behavioral Responsible Conduct of Research. Move on to Question 4. Biomedical Research: Required CITI Courses – Biomedical Research-Basic/Refresher & Biomedical Responsible Conduct of Research. Move on to Question 3. Question 3: Does your research involve a new drug, medical device or dietary supplement? Yes: Additional Required CITI Course – Good Clinical Practice (GCP) Researchers required to take a GCP course should choose the appropriate course based on their type of research and whether the research would have an international focus. Most should take the U.S. FDA Focus course. No: Move on to Question 4. Question 4: Will you access private health data? Yes: Additional Required CITI Course – Information Privacy Security (IPS) for Researchers. Move on to Question 5. No: Move on to Question 5. Question 5: Is or will the research be externally funded or do you have any potential conflicts of interest regarding your research? Yes: Additional Required CITI Course – Conflicts of Interest. No: No further additional CITI courses required. There is no cost for the training, but registration is required. You may complete the training in one session or complete part of it and return. After completion of the training courses, you will receive a certificate. The certificate is applicable for three years from the date of completion. 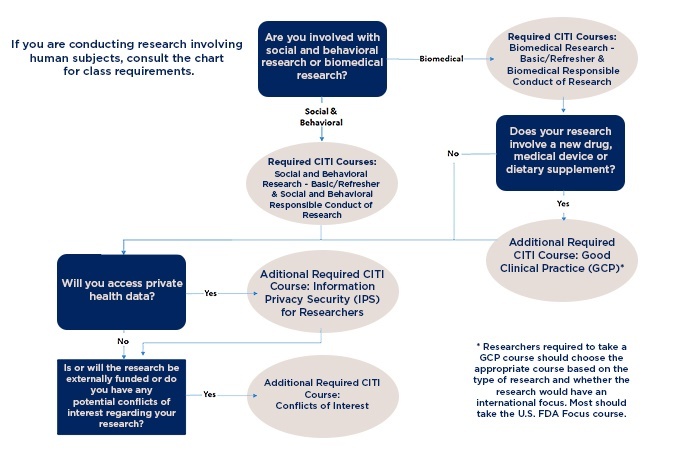 Please carefully study the CITI certification and training chart below and select the CITI courses that best match the type/s of your research you will be doing. Once you have identified them, go to the CITI website and register for a new account (assuming you don't have one yet). Note: To make sure the registration process does not run into any major issues, please make sure that under Select Your Organization Affiliation you either enter or choose "University of North Georgia" and associate your CITI profile with your current UNG email address. For UNG faculty and staff you should use the UNG email address that contains your first and last name (ex. FirstName.LastName@ung.edu). Students should use their UNG student email address (ex. abcde1234@ung.edu). The IRB's online application portal, IRB Manager, will check UNG researchers' CITI training when an application is submitted, but only for UNG researchers that have associated their CITI profile with their current UNG email address.